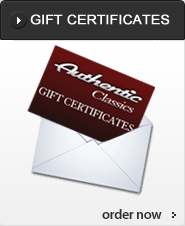 AuthenticClassics.com - Everything you need for your Vintage & Classic Mercedes Benz! Proud Supporters of the Mercedes Pagoda & 190SL Group. Fast Shipping - We stock what we sell - most Orders Ship same Day! Seal Ring for Axle Input/Pinion Shaft - 108,109,110,111,112,113,186,188,189,*198Ch. Early Bosch Fuel Pump - Rebuilt, fits 230SL, 250SL, *280SL & others. Price includes $300 Core Chg.
International Orders Welcome, please click Here for FURTHER Information. IF YOU HAVE A PART REQUEST, Please Include the Vehicle Year, Model and Chassis Number with your request.